Ponoko Jewelry Design Challenge Winners! Remember awhile back when I told you I was asked to help judge the Ponoko Jewelry Design Challenge? Well they announced the winners earlier this month! People were asked to submit their jewelry ideas to Ponoko and from there they chose the invitation round winners. I was sent that list of about 20 entries and asked to choose my favorites. I sent my list back to Ponoko and the other judge Dan Emery and the Ponoko gang chose the final winners. Here are a few of my favorite entries! A Screw Loose: I chose this necklace for several reasons. Fist being that it caught my attention more than the other designs and is something that I would wear. Statement necklaces are the must have accessory for spring and summer 2008 and Screw Loose definitely counts. I thought the project was a perfect combination of materials, design and a sense of humor. A screw loose is “a reaction to the frustrations of building flat-pack furniture”. Anyone who has ever made a trip to IKEA feels their pain. 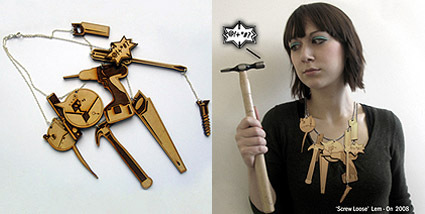 The large necklace has charms for everything you will need including: hammers, saws and drills. There is of course some assembly required, but this gives you a little liberty with the design so that each necklace can be different for each person. The Hair comb by Schofe was a very close second place for me. I love the vintage look of the comb as well as the fact that they were the only people that submitted something to be worn in your hair. I have always wanted a large elaborate antique celluloid hair comb, but they are so expensive. These are only $10!!! There is something very lovely and organic about the Orchid Necklace by Nervous. Thirty-nine layers of plastic are sculpted into a complex form inspired by the morphology of orchids. The layers are held together simply with red silk cord. As far as good design these guys really nailed it. If you dream of amazing things you could have cut out of acrylic or wood check in with Ponoko. All you have to do is dream the shape, make it into a computer file and send it over to them, choose a fun color of acrylic or wood, pay, then they will cut your shapes and send it to you. From there you can make jewelry, puzzles, furniture – whatever your master plan is. You can even sell them through Ponoko! Posted April 16, 2008 & filed under Jewelry. oh the hair comb is the BEST!! I’m gonna go buy me one! I am LOVIN’ that orchid necklace!! What a great hair comb! My absolute favorite.